Police impersonators are committing crimes, often violent in nature, under the guise of a routine traffic stop or a knock on the door. How can you tell if a law enforcement officer really is who he says he is? Just this week, a 75-year-old man was arrested after he allegedly identified himself as a member of the sheriff's department and forced his way into a woman's home. The woman's son called 911 to thwart the attempted armed robbery, deputies told Los Angeles' KCBS-TV. Spotting a fake police officer from behind your front door can be tricky, but there are a few signs that could tip you off. First, listen for the officer's knock and announce. Next, look for a uniform, a utility belt with all the bells and whistles, and other equipment commonly carried by police officers. 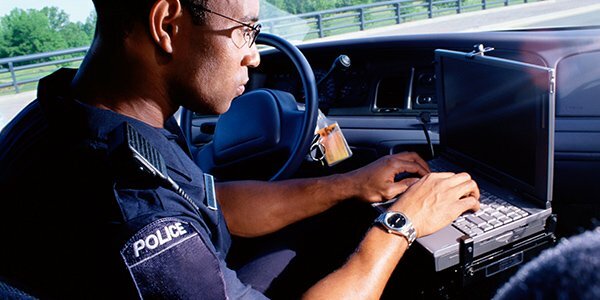 Large online companies have generally prohibited the sale of law enforcement badges, uniforms and sirens from their websites, so try to become familiar with your local law enforcement's uniform and badge designs. Still, there's a big market for authentic-looking police gear, so if your gut tells you it's a fake uniform or badge, don't open the door and call 911 to confirm it's really a legitimate officer. The easiest way to identify a police impersonator during a traffic stop is to spot a fake cop car. "If a car looks older, aged, and maybe not running in good condition," those may be signs of a police impersonator, a police sergeant told Georgia's WRBL-TV. When it's dark out, look for reflective decals on the side and hood of a police car. You can also tell if the car is real by the lights: Flashing LED bar lights in addition to flashing headlights are equipped on most police cruisers. Also, listen for a warning siren, which officers often use to let the person they're stopping know they're the real deal. Also note that some states prohibit the use of unmarked police cars, and may even require flashing lights mounted on top of law enforcement vehicles as a way to thwart police impersonators. Strangely enough, some cops are getting comfortable with Facebook -- but so are impersonators. Look for vague references to one's employer, and a profile photo depicting an eagle, the flag, or other symbols instead of the officer's head shot, suggests PoliceOne.com. If the photo albums don't have pictures of real people, it could be an impersonator. If you have doubts about a police officer -- be it a badge that looks "off" or a light that isn't quite built into the car -- consider taking some precautions. In many states, you're legally allowed to pull over in a well-lit, public place where there will be witnesses, or have a 911 dispatcher verify the officer's identity, a state trooper told Cleveland's WEWS-TV.